To understand Sage and its approach to cloud is not as simple as many customers, or would-be customers, might hope. In common with many of its competitors and peers, it is happily ‘cloudifying’ itself with gusto. Much of the drive comes from the desire to switch from selling products to improving earnings by moving to a subscription business. To believe financial gain is the only reason for so much cloud interest is to underestimate the potential for Sage. With its public cloud offerings it already has a monthly improvement cycle. Updates, fixes and new functions install ‘beyond the customers’ ken’. This makes operations easier for both Sage (as the vendor/supplier) and for those customers who no longer have to worry about their operations. This is all part of the promise of ‘cloud’. People – a people management system for hiring, retaining and growing the workforce. Sage Intacct – which Sage bought in 2017 and which added both cloud capabilities/understanding but does duplicate some area of function covered above. The Sage public cloud is a multi-tenanted solution. It is the preferred option (for Sage) when selling to new customers. Amazon Web Services (AWS) hosts this for Sage, with Sage managing its configuration and operation, including updates and improvements. This occurs transparently for the Sage customer and has a record over the past year of 100% uptime. Not all is perfect in the Sage public cloud, especially if you are an existing customer. Necessarily not all the functions available in on-premises product purchases are available, though this difference will likely diminish with time. concerns about security or reliability. A private cloud can be on-premises (for example on a customer-owned ‘cloud box’ like that available from Neostratus). Or the customer might prefer AWS. For private clouds the T&Cs with Sage must adapt to each specific customer circumstance. A hybrid cloud occurs when, for example, a Sage customer has an on-premises solution but Sage offers functions only available from its cloud which is relevant to that customer. Typical examples are VAT and tax calculations. As these change often it makes sense to locate the latest function in one place. The on-premises solution connects to the Sage cloud for these specific functions – hence hybrid. As if these variations did not embrace sufficient variables, there is one more. Sage 50cloud combines with Microsoft Office 365. This runs on Microsoft’s Azure, again with Sage managing the cloud deployment. Sage has two major technology improvements underway. Both relate to cloud. In the first it is developing a new cloud architecture based on containerisation (Docker). 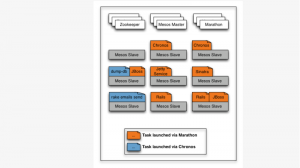 Part of this work involves using the open source tool Meso Marathon for orchestration, especially for scale-up/down resource flexibility and service discovery. When complete this initiative will phase in gradually to existing cloud implementations. The second moves beyond the capabilities of Sage’s existing 4GL language. It will introduce a service-oriented framework based on Node.JS with the use of Typescript. The advantage for Sage, and for partners wishing to create their own extensions, is that APIs become king. By adopting a microservices approach, Sage obtains far greater application development flexibility, as do its partners. Together these two initiatives, when complete, will represent a major refresh of Sage’s ‘infrastrucure’, one which optimises for cloud. Piecing together the Sage cloud story isn’t straightforward. On one level this does not matter – at least for new customers. Sage or its partners will assess the business function required, and then to the most applicable cloud implementation. For existing customers, especially those with a greater degree of customisation or third party extensions, the cloud may be further off. Even in the longer term difficult choices are likely though containerisation and microservices for development may facilitate improvments. For Sage the appeal of cloud technology is financial (recurring subscription revenue), operations and greater simplicity. It is logical why Sage clouds its future. For SME enterprises it should diminish infrastructure concerns for the future.